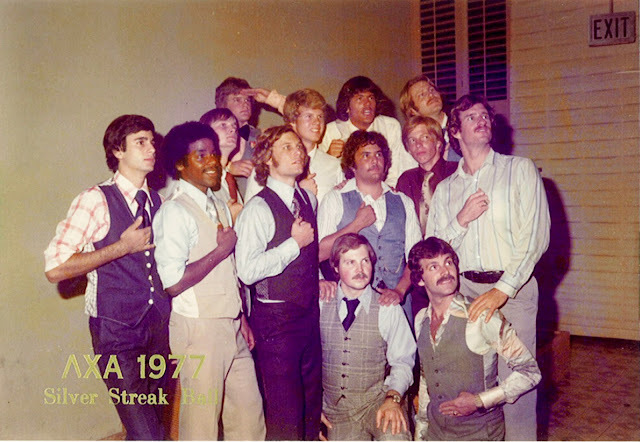 The following "CLASSIC MOMENT" in EpSig History was submitted by Old Bro Gary Messerotes (EpSig 644) and was taken at the "Silver Streak Ball" Winter Formal in 1977. I'm sure you all remember who your "Big Bro" was when you first joined the Lambda Chi house, as well as any "Little Bro's" who you "mentored" when they became a part of the EpSig tradition at UCLA. This photo honors the prolific Bill Harrison (EpSig 631), who gained legendary status for the size of his "family tree" -- his Little Bro's, Little Grand Bro's, Little Great Grand Bro's, etc. That's our boy Bill kneeling front and center, with the "family" surrounding him. Not sure exactly what they all are watching ..... Bruin game on TV ? Jim La Peter threatening to streak the ballroom ? 1) If anyone would like a digital copy of the photo in this blog post, send me a note and I'll get it to you. 2) If anyone else has any CLASSIC MOMENTS in EpSig history you would like to share, send them in and I'll get them published for everyone to enjoy.